It is possible to Deactivate Facebook account temporarily or You can Delete Facebook account permanently. Facebook is the biggest Social media platform all over the world. Nowadays a lot of people are using Facebook and their free time but many of the people don’t know how to deactivate their account temporarily. 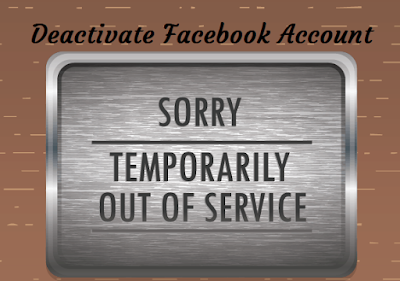 It is not easy to find deactivate account option in Facebook. Here is the complete tutorial on how to Deactivate Facebook account temporarily. A lot of people are deactivating Facebook account due to Some Silly reasons like the fight with their beloved ones are they want to be alone for Sometime. By deleting the Facebook account you will miss a lot of opportunities like connecting with new people, Job opportunities as well as messages from Your beloved ones. If you are new to Facebook then create an FB account. You can delete your account and can deactivate your account. You have to know the difference between delete and deactivate the account. If you delete your account you cannot retrieve but if you deactivate your Facebook account you can Reactivate your account by simply sign in when you want to back. By deactivating your account Facebook does not remove data like photos videos which you have shared on your timeline. You can watch your share data after reactivation of your account. First, you have to decide whether you want to permanently delete or temporarily deactivate of your Facebook account. If you deactivate your Facebook account none of your friends will find Your profile. You are profile will invisible to all of your friends until you Sign in to your account. Firstly you have to sign in your Facebook account. Now enter your Username and password to sign in to your account. Click on down arrow mark Which will appear on the top right corner of your screen. In which you will get an option like settings, which is the second option from the bottom. Now choose the general option from settings. Then click on manage your account option. By scrolling down you will get option Deactivate your account. Click on that. Now go to deactivate your account. Here you need to answer a few questions in order to deactivate your account. Then click on the Deactivate option. By clicking deactivate option, a new window will open with options like “Deactivate Now” and “Close”. Tap on “Deactivate Now” option to complete your process. Firstly open your Facebook application From your mobile. It will ask you to login to open your account. If you are logged in to your account just open it. If not you need to enter your username as well as password. Click the horizontal lines symbol which you will get the top right corner of the screen. After that, you will get settings & Privacy option to tap on that. Now click on account settings option. You will get options like accessing your info, activity log & Account ownership and control. Click on Ownership & control. After clicking that you will get delete or deactivate account. Click on that. By clicking manage account option, You will get deactivate option which is on the bottom right corner. Click on that. It will ask you to enter your password for security reasons. Enter your password then tap continue to move further. By doing so you can reactivate your account at any time just with your username and password. If you want to continue with chat on messenger even after deactivation then Tap on keep me sign into the messenger or else leave this option. At last click on deactivate option Which is on the bottom of the page. By clicking this your account will immediately deactivate. Simple right! But make sure that you are deactivating the FB account but not deleting. Do let us know in the comment section below if you have any queries. I think you can know easily Deactivate Facebook Account Temporarily. Help us by sharing this article with your friends.